Publisher's Weekly: J.M. Berger's "Jihad Joe" Is "Timely" and "Chilling"
Publisher's Weekly is out with the first official review of Jihad Joe: Americans Who Go To War In The Name Of Islam. "Jihad Joe" hits bookshelves on May 15. Investigative journalist and documentary filmmaker Berger lifts the veil on the phenomenon of American jihadists in this timely and chilling examination. 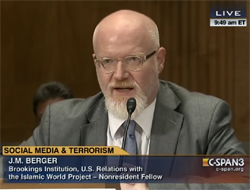 [...] Berger's exposé painstakingly lays out the scope and character of the American jihadist movement and points the way to a national debate on solutions.